Victoria, BC, March 19, 2019 – On March 16th, Game Plan & Canadian Sport Institute Pacific (CSI Pacific) teamed up to host the first ever Athlete Advance Powered by Game Plan event. The event took place at The Westin Bear Mountain Resort in Victoria, BC. The Athlete Advance is a one-day event, free to all Canadian Sport Institute Pacific registered athletes. The focus of this year’s Athlete Advance was leadership and communication and featured keynote speaker Jennifer Walinga, Olympic and World Rowing Gold Medalist. Attendees were invited to propel their sport careers by participating in interactive workshops and seminars presented by world-leading experts in high performance sport, Tamara Smith & Jennifer Dowdeswell. This year’s Athlete Advance hosted 50 athletes across 15 different sports and was supported by 20 partners. It was the third year overall for the Athlete Advance, which had been hosted solely by CSI Pacific in previous years. Attendees were also given the opportunity to engage with an athlete panel with highly accomplished CSI Pacific registered athletes. This year’s panel consisted of Nate Riech (Para-Athletics), Andrea Proske (Rowing), and Harry Jones (Rugby). “It was great connecting with athletes from other sports. 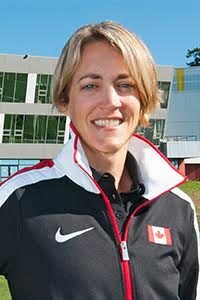 I also really enjoyed thinking deeper about how sports impact my business and work after rowing,” said Avalon Wasteneys, CSI Pacific-registered athlete and Canadian Elite rower for Rowing Canada.